Poll: Have you upgraded to iOS 5? If it ain't broke, don't fix it -- right? We know countless reviews of the iPhone 3GS may begin with that cliché, but there's little chance you'd find a better way to describe the strategy that Apple has just put into play with its latest smartphone. 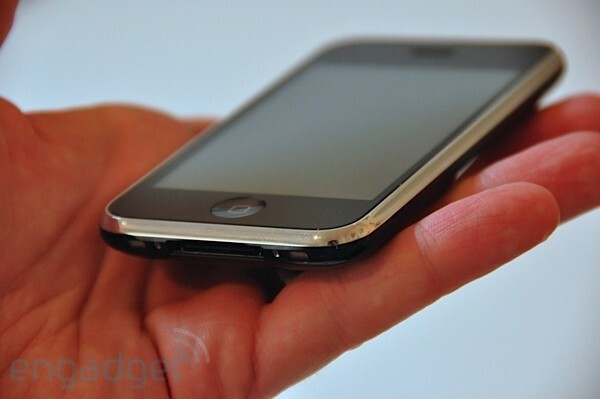 In many ways, the 3GS is a mirror image of the iPhone 3G; externally there's no difference. It's inside where all the changes have happened, with Apple issuing a beefed-up CPU, new internal compass, larger capacities for storage, and improved optics for its camera. 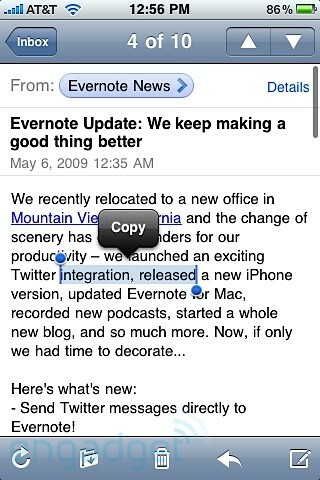 More to the point, the release of the 3GS coincides with the launch of iPhone OS 3.0, a major jump from previous versions of the system software featuring highly sought after features like cut, copy, and paste, stereo Bluetooth, MMS, tethering, video recording, landscape keyboard options for more applications, and an iPhone version of Spotlight. At a glance, what Apple seems to be doing is less a reinvention of the wheel and more like retreading the wheel it's already got (and what a wheel, right?). 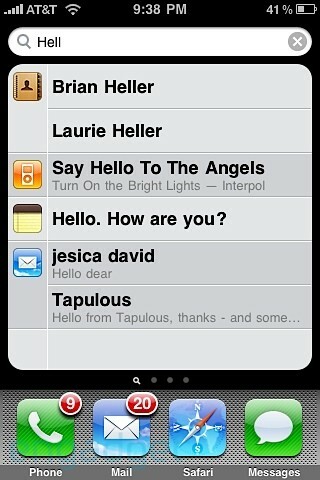 So, do the iPhone 3GS and OS 3.0 tweak the details in just the right places, or has Apple gone and gotten lazy on us? Read on to find out. As we said in the intro, there is nothing visually different about the iPhone 3GS versus the iPhone 3G, save for the lettering on the back, which is now mirrored like the Apple logo. 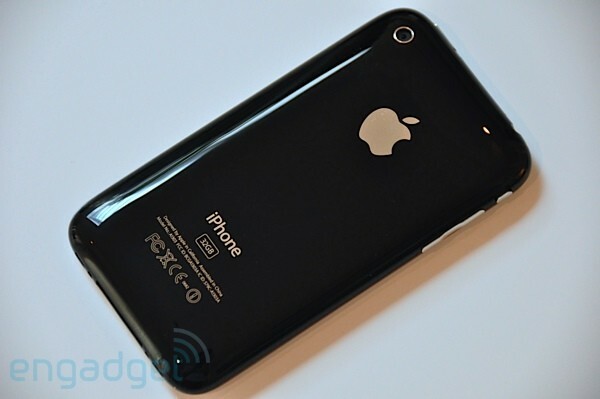 While we had seen leaked images of a matte finish, bezel-free version of the device, when push came to shove, what we got was essentially a carbon copy of the iPhone 3G. In terms of the general elements of the phone -- the plastic casing, mute switch, home and power buttons, etc. -- there is no change at all. In fact, if you were to lay this phone and its predecessor next to one another face up, the new model would be indistinguishable. 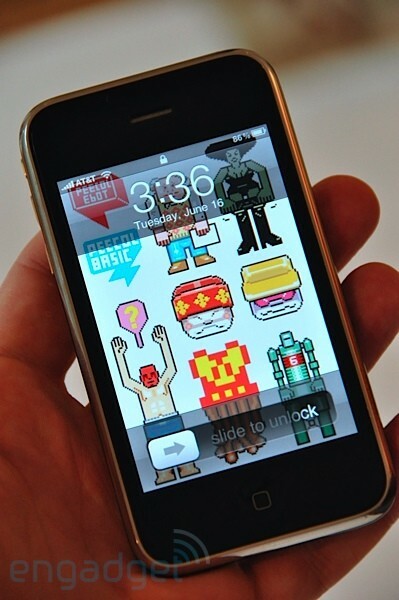 Of course, the 3GS is not just a clone of the previous device, and Apple has made most of its significant changes inside the phone. First off, the company has supercharged the CPU of the 3GS (remember, the S is for speed), jacking up the processor numbers from 412MHz to a rumored 600MHz. Additionally, the RAM is said to have doubled from 128MB to 256MB, the phone is offered with 16GB or 32GB of storage, and Apple has swapped out the previous graphics chip for a new version -- dubbed the PowerVR SGX -- which adds support for more robust visuals via OpenGL ES 2.0. All this should mean that end users will see a noticeable difference in app speeds and loading times (Apple claims an average of 2x faster loads, though since the company has been cagey about upgrade details, it's hard to know what the real differences are). 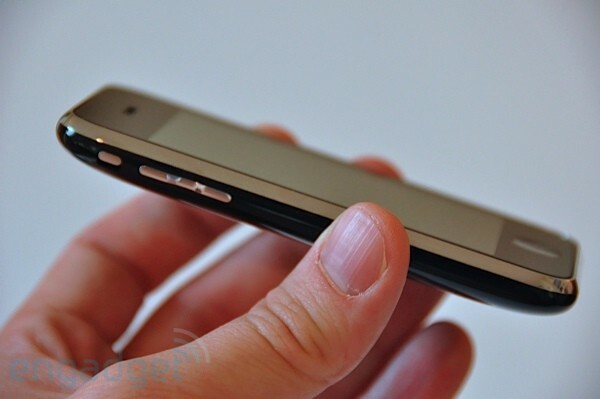 So, do the revamped insides equal an improved experience on the phone? Kinda. For our oft-used phone actions -- flicking through homescreens, calling up search terms in Spotlight, scrolling through long lists -- we definitely felt like the 3GS was snappier than its predecessor. It wasn't like the doors were flying off, but there was a noticeable bump in speed, particularly when it came to initial data loads (how quickly you see content pop up within an application). When it came to opening apps which pull lots of that kind of content, like Contacts, Calendar, or Messaging, we saw an even more noticeable improvement. Comparing the 3G and 3GS side-by-side yielded small but absolutely palpable differences -- the 3GS does seem to eliminate quite a few of the hangs we find maddening as we go through our day. It's not the perfect salve, but it's a start. We're excited by the cranked up CPU, but in our experience you'll see lowered load times (though obviously not as drastic) if you take a standard 3G and do a full restore, so there is the lingering question of whether or not the jacked-up feel of the 3GS will last, or will begin to bog down after months of use and heaps of data. A spot where we really saw the fruits of Apple's labors (and one we don't expect to decline as you pile on data) was actually in the more graphically intense apps for the phone. Comparing a CPU-hungry 3D game like Resident Evil: Degeneration on the 3GS with the same title 3G yielded striking results. The load time was drastically reduced, and rendering and frame rates on the game were noticeably smoother than on the older device (though game speeds stay the same) -- a side effect of the more powerful guts we'd hoped to see, but weren't sure would be so stark. If you're an avid gamer looking for the device with more power, the difference will be crystal clear: the 3GS obviously flexes in this department. We mentioned that Apple didn't really make any cosmetic changes to the phone, but that's not entirely accurate. While the 480 x 320 display on the iPhone 3GS is technically identical to its predecessor's screen, it adds one small feature which should make some users extremely happy. The company has changed the treatment on the surface of the touchscreen, utilizing an oleophobic coating -- essentially a protectant that's highly resistant to fingerprint smudging. For those of you constantly wiping burger grease, WD40, and various other toxic materials from your iPhone, this will come as a tremendous little perk. The most surprising thing about the tech is that it actually does what the company says it will: namely, it resists new smudges and wipes almost entirely clean with a single swipe on a pant leg. This wasn't exactly the most pressing issue we had with the phone, but it's nice to know that Apple is innovating in the dirty screen space. A camera tweak is a big deal for iPhone fans -- after all, they've had to suffer through not one, but two iterations of a phone with a paltry 2 megapixel camera, no autofocus, and no flash. Apple has tweaked two out of three here, and as Meat Loaf tells us, that ain't bad. The 3GS upgrades the built-in camera to a 3 megapixel version -- not insanely great, but at least competitive -- and has added an autofocus function with a nifty software tie-in. Instead of having to use a gross physical button to snap your shots, the iPhone continues to rely on its onscreen trigger, but cranks up the use of that big display by allowing you to focus in on subjects based on where you tap. In our experience, the parlor trick actually turned out to be quite useful, accurately zeroing in on what we wanted most of the time. Struggles to focus were minor at best, though you won't be able to do any heavy macro work here, and during video recording you're stuck with a constantly focusing lens -- no tapping allowed. We do have some complaints about exposure, which seems to be permanently cranked to "blinding," and while the shutter speed is faster than on the 3G, it's still not quite snappy enough for our taste. Hey -- we guess we should just be glad they gave us an extra megapixel, right? As we said in the opener, the 3GS launch isn't just about the hardware -- in fact, you could argue that it's hardly about the hardware. The biggest changes with this device really come in the form of software tweaks, and to a point, the software tweaks provided by iPhone OS 3.0. Apple really piled on the fixes and additions in its latest OS iteration (the company boasts of 1,000 new APIs for developers), and there's plenty to plow through that up until now has only been the domain of those lucky / hard working few. What's all the fuss about? See below. We'd like to preface this section by saying that because we're testing a US device, MMS and tethering options are disabled thanks to AT&T's current policies on the services. Obviously, not being able to properly test two of the most anticipated aspects of the new OS is disheartening, and while we could hack a solution to get both working (see here), it's not a reasonable option for most end users right now, and probably wouldn't be fair to include in this review. On a "brighter" note, AT&T claims it will be delivering MMS to the iPhone come late Summer as part of its standard SMS packages (no word on tethering), though we think it's patently absurd that the second largest carrier in America -- a carrier which currently has MMS enabled for all of its other devices -- is failing to make this available at launch. Judging from the reaction to this news during the WWDC keynote, it would seem that most others agree. Apple included. Of all the features added to the new 3.0 cocktail, copy / paste is easily the most talked about. Perhaps because it was such an obvious feature to leave out to begin with, or perhaps because Apple made it through multiple updates with no change (till now). Regardless, the iPhone line now has the ability to perform one of the most basic tasks known to computing. So how does it fare? Well, it's actually a pretty smart implementation of the process on a mobile device -- one of the best we've seen. To grab a chunk of text, you simply tap on the section you want to grab and the phone tries to figure out just how much you meant to select. Usually it's pretty smart about what you want (sort of the copy / paste version of Apple's predictive text input), but it also gives you anchors to grab on the top, bottom, left, and right of the selection box, allowing you to pull your copy area out as needed. A contextual menu appears above or below your selection, and changes based on what stage of the process you're in. To paste you just tap on an empty spot in a document, and the menu presents itself again. For undoing actions, you shake the phone (cute, but a little annoying -- we would have preferred a menu item). The beauty here is that unlike competitors such as the Pre or Android, iPhone copy and paste doesn't just let you grab text -- you can grab whole chunks of mixed media, like text and images, and it will copy the content with proper formatting and elements. If you want to pull out a section of a webpage, for instance, the function elegantly allows you to zero in on the area you want to copy and easily transfer it into an email or document without losing any components (unless you're pasting into a text only area, like Notes, which strips out formatting and images). While we don't think the wait was necessarily justified for a feature so simple (and so necessary), we do think Apple has pulled off a tremendously useful implementation of the process. It's the kind of thing you'll miss once you go to another device without such broad and universal functionality. Way back in June of 2008, Apple promised that we'd see push notifications -- instantaneous alerts for emails, messages, and other app-related notices -- due in an OS update come that September. Needless to say, the fall came and went without so much as a mention of the software addition. Earlier this year, Apple showed off the functionality again at the iPhone OS 3.0 preview, combatting arguments for true multitasking within the iPhone operating system by saying push would not only work as a surrogate for most background tasks, but would allow the devices to retain sufficient battery life. Background tasks, Apple warned us, create a drain on power that would have users running for their chargers far too often. So -- do push notifications take the place of background tasks? Do they give the end-user the feeling of constant connectedness the way Apple seems to intend them to? In our experience, not quite. At the time of this writing, there are only a few apps actually employing the service, though we're sure more will come. Overall, where push is really useful is in receiving updates or messages -- individual pings which direct your attention towards a particular application -- but they don't keep you in the stream of information the way an AIM session running in the background does. 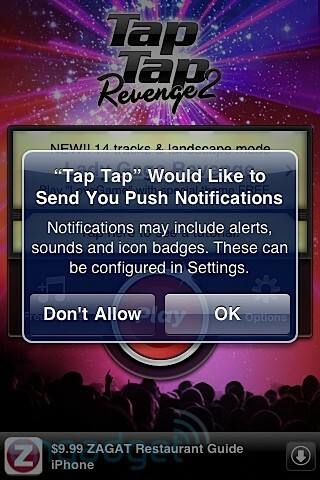 Yes, you get alerted to new messages (or in the case of something like Tap Tap Revenge, challenges), but those appear as either one of the iPhone's annoying pop-ups, or as a background audio notification coupled with a growing message counter for a particular app (AIM for instance). The service is extremely useful, and we're happy that Apple is endeavoring to make it available for all of its developers, but from a practical perspective, it doesn't feel that different than an email notification or a calendar event. In short, it will help you stay connected, but it won't take the place of true multitasking, and unless Apple finds a less obtrusive notification solution, it could actually create quite a mess. Besides those obvious issues, we're still not seeing push for the things we really want, namely, Gmail. We don't know when (or if) a rollout of said feature is planned, but we're guessing it can't be too far off for a device which now has central functionality orbiting around this feature. Ultimately, we still feel strongly that true multitasking can't be replaced by these notifications, and if there's anything we learned from using the Pre, it's that background tasks can be handled elegantly without a mind-blowing hit to battery life. For a company which prides itself on advanced battery tech, you'd think instead of shying away from the challenge, Apple would be looking for ways to innovate in this space. We've got to hand it to Apple -- the company has really answered the call when it comes to search functionality on the iPhone. The addition of Spotlight to the iPhone OS is quite notable for two reasons: first, it gives you homescreen access to a full search of all your content on the device, including notes, email, contacts, calendar events, and applications. Secondly, it provides new search functionality within mail that not only lets your get at downloaded messages, but extends the hooks into server-side content. That's a bit of a stunner, as we can't count the number of times we've needed to fish some info from an email that had long moved outside of our 200 message limit (and what's up with that anyway Apple?). 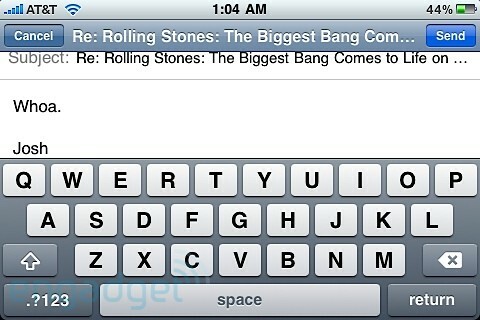 Spotlight searching works flawlessly in email, but we have a few gripes about the phone-facing implementation. To start with, in order to navigate to your Spotlight screen, you have to either assign the home button double-tap shortcut to take you to the search window, swipe back when you're in homescreen view, or single tap once to get to your first page, then again to get into Spotlight. It all seems a bit complicated to us -- what would have made more sense was some kind of universal gesture... like maybe that long home button press reserved for Voice Control (more on that in a bit). Another problem is that you still have to jump through multiple hoops to get to the content you're looking for, particularly with contacts. Once you bring up a name, you have to actually jump into the contact card to call or send a text message -- why isn't this info accessible from the search window? As with a lot of processes on the phone, you still feel like you're clicking through way, way too many screens to get where you need to be. Okay -- you got us. 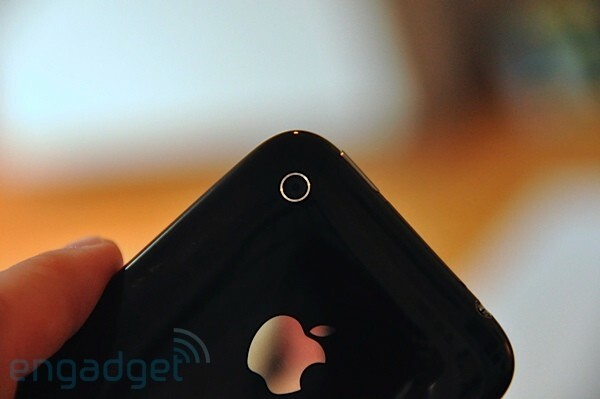 Video recording on the iPhone 3G S is really quite impressive, and there are two reasons why. For starters, the phone handles pretty fantastic looking VGA video at 30 FPS, which makes for not just passable mobile video, but usable mobile video. The size, clarity, and smoothness of the sequences we shot looked tremendous to our eyes -- certainly on par if not outclassing many of the contenders in this space. In our opinion, the 3GS video quality is high enough that we'd consider this a viable stand-in for lower end camcorders or flip cams -- if you want to capture your kids at the park but don't want to come packing a ton of gear, this produces totally reasonable results. 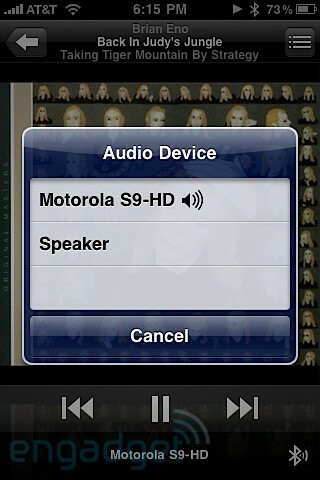 The second reason we're a fan of the 3GS video functionality is simple: editing. After you snap some video, you can easily pull out just the section you want to use in a kind of dumbed down iMovie edit window, which gives you a timeline of your clip, replete with a preview of the action. You can long-press on the section you're editing to see a more detailed view, and you can pull either the start or end points to snag just the section you want. We love the fact that you can grab and cut video in-phone without having to offload anywhere else, but we'd love it even more if OS 3.0 allowed for non-destructive editing of the clips. As it is now, once you cut something down, you're done -- there's no way to retrieve the full length version of the video. We're hoping in future version Apple gives users either the option to retain the deleted sections, or at least the option to copy the clip over to a new file. We wouldn't scoff at an option to splice or merge multiple clips together either, but we don't want to break the bank with our lofty requests. One other nice feature that's been tacked on the video tool is the ability to auto-compress and upload to YouTube, MobileMe (a 45 second video took about three minutes to up over WiFi), or send a .MOV in an email. If we had a device that could actually utilize MMS, there's an option for that as well. Voice Control is a bit like an answer to a question that no one asked. The basic premise is that Apple has given 3GS owners the ability to control their phone via simple voice commands, relayed through a glitzy Voice Control homescreen (which is accessed by holding down the home button for a few seconds). As you issue commands, the screen provides fly-bys of possible actions, ostensibly to make the process a bit easier on those with a blown short term memory. In practice, the application performed admirably when we made specific requests, whether it was dialing contacts, or playing a particular band -- though it wasn't without its hang-ups. The first problem we encountered is that it would sometimes just mishear us altogether, for instance, we asked it to "play M83" and it thought we wanted to listen to a playlist called "Pre" (oh the irony). Another irksome behavior is that you can ask Voice Control things like what song is currently playing, but after telling you, the app closes itself, forcing you to reopen if you want to change the track or perform another action. This seems like weird UI design to us -- why wouldn't Voice Control stay open until we were ready to close it? We also discovered that the range of options for voice activated functions are quite limited -- if you want to do anything beyond controlling music playback or making calls, you're pretty much out of luck. There's clearly a lot of use for something like this when driving or working on something which keeps your hands away from your phone, though you still have to engage the app physically, so we're not sure how much you'd get out of it in those situations. The whole concept seems something very much in the vein of Cover Flow -- a really impressive component for the phone that just doesn't have a ton of practical use. Yes, your friends will think it's pretty cool, but as a pragmatic group of gadget nerds, we don't see a tremendous need for this functionality. Perhaps Apple will give it a little more undercarriage work in future versions of the OS, because we see lots of interesting places they could take it. It may seem like an odd choice, but Apple decided to stick a proper compass inside the 3G S. At first we were a little perplexed by the addition, since we've gotten in this weird habit of expecting bolder moves from the company. Still, in practice the inclusion of a hardware compass is actually really helpful when it comes to doing things like navigating a new city. As far as the hardware is concerned, the compass seems to do what's promised with pretty impressive accuracy. The Compass app itself, viewed as a standalone product, doesn't really do much for us. We rarely have a need to know which direction we're facing or where north is in relation to where we're standing -- it's just not a piece of data we typically use. The combination of Google Maps and the compass, however, is a powerful marriage that could put an end to many of your navigation woes. Within Maps, you now have the option to not only locate your position via GPS, but orient the map to the direction you're facing. 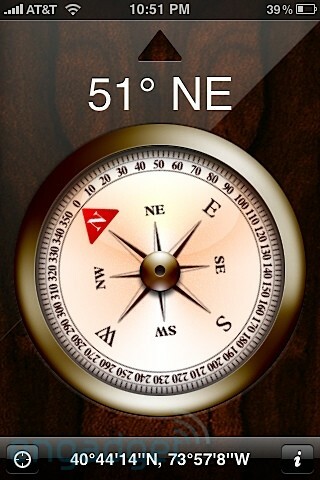 Once the compass picks up your bearing, it rotates the map to reflect. This may not sound like much, but if you've ever tried to walk a new city using just maps and geolocation, you'll understand quickly. Being able to not only see your surrounding landmarks, but how they relate to you from a directional standpoint is incredibly useful, and we found ourselves reaching for the help often with the 3GS. One sour note was that you're not treated to the same reality-bending feat of using the compass while in street view (as Android does -- always great at parties), though it's a minor complaint. We can't say what extended functionality the compass will hold, but the pairing with GMaps here is enough to make it a worthy addition in our opinion. 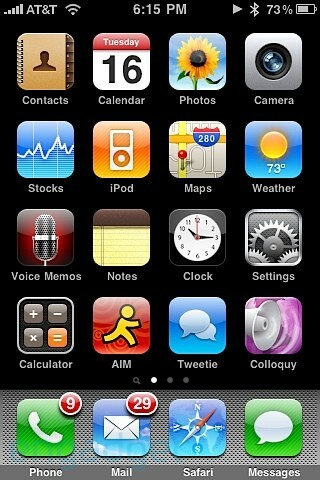 There are lots of little odds and ends, improvements both small and large, in the iPhone OS 3.0. At the time of this writing, anyone with an iPhone or iPhone 3G should be able to download and test most of them, but we wanted to give a brief overview / opinion on the ones that stood out to us. The first big one that stands out is the extension of a landscape keyboard to all of the main applications in Apple's arsenal. That means you now have access to the more spacious layout in Mail, Notes, Messages, etc. There are a lot of users out there who were hoping this day would come, and we'll admit, our typing accuracy definitely goes up when we bust out the broader keyboard. Like copy and paste, this is probably an addition that should have been part of the package right out of the gate, but better late than never guys. Another addition is the inclusion of Nike+ for the 3GS. The app itself is identical to the version which we've already seen for the iPod touch, but it's now in convenient iPhone form. We don't know about you, but carrying around the iPhone for a jog doesn't seem like the best option to us (then again, we don't know if carrying around a touch is preferable). Still, we won't knock Apple for trying to cram as much functionality into this thing as possible -- this is a welcome addition. And for those wondering about A2DP -- it's here, and it works flawlessly. Testing things out with the Motorola ROKR S9-HD yielded a simple pairing right out of the gate, and the sound quality was excellent. We thought we'd never see the day where Apple came around to a stereo Bluetooth profile, but it's here, and it's fantastic. It's clear that Apple has taken great pains to listen to users and go over the OS with a fine tooth comb -- you see the company's careful work in places like the call log (which now shows much more detailed info on callers), upgrades to standard apps like Stocks, and the thoughtfulness of adding oft-requested features like voice memo recording. We're not saying Apple has gotten kind and gentle, but the company does seem more kind and more gentle as it insinuates itself into the mainstream. Apple claimed that the battery life on the 3GS is somehow better than what we've previously seen on the 3G, but in our tests, we could barely tell the difference between the two handsets. First off, in terms of talktime and data over a 3G network, the count is exactly the same (five hours) -- though the battery gains two hours (up from 10 to 12) using 2G. Where the differences really show according to Apple are during strictly WiFi, video, or audio use. The claim is that you'll see roughly three to four more hours of life out of the device in those scenarios, but honestly, if you're just using this thing to play audio, why did you bother getting an iPhone? In our tests -- real world, admittedly non-scientific tests -- we hardly noticed a difference in battery life between the new and old model. The point is, you're still very much in the same boat when it comes to general use -- but on the plus side, there's no noticeable deficit in power with the new version (though we have yet to see what heavy video capture does to a full charge). As with any phone, the big, highlighted number you see advertised left and right for the iPhone 3GS -- $199 for the 16GB version and $299 for the 32GB -- is the new contract price, which means there are plenty of thick, barbed strings attached. If you're still using a RAZR from 2006 and you haven't touched your service or bought a new phone directly from the carrier since then, you're almost certainly in business with these maximum subsidies; AT&T's made its money off of you several times over and it's willing to put a little dough back in your pocket once again in order to get a whole lot more out of you over the course of a contract. On the flipside, customers who have been upgrading religiously from iPhone to 3G to 3GS will not necessarily be eligible for those most lucrative prices unless they paid the off-contract price for their 3G (to avoid re-upping the contract they were already on) and are now out of contract altogether -- unless AT&T says otherwise, of course. More on that next. If you're what AT&T calls "ineligible," you have a a few options. The company has taken the very unusual step of letting iPhone 3G customers who are becoming upgrade eligible in the next three months through the end of September (note that this can be, and usually is, different from the date that your contract is up) can take advantage of the fully subsidized pricing. The way your upgrade eligibility date is an inexact science, involving Magic 8-Balls, mainframes from the 1960s, and faerie dust, but the bottom line is that you need to check with the carrier to find out when that date is (you can see it using online account management -- no need to call in). You can always add a line, assuming you clear the usual battery of credit checks, which would also get you back in the game for $199 / $299 -- the tradeoff being that you're stuck with another line of service, of course, which ends up significantly outweighing any subsidy advantage upfront by the time your new contract has run its course. If you want to upgrade your existing line early, you can do so for $399 or $499 for the 16GB or 32GB model, respectively, and for contract breakage newbies, that can definitely be an unwelcome shock to the wallet. Even folks who upgraded from the original iPhone to the 3G and don't become eligible in the next few months won't much appreciate what's going on here, since they'd essentially paid "full price" for the first model which allowed AT&T to offer the 3G at maximum subsidy provided customers re-upped their contracts. At any rate, keep in mind that buying in at these $399 / $499 price points will extend your contract back to two years, because -- believe it or not -- they're still slightly discounted. If you want to buy a 3G S outright without the moral and financial dilemma of signing your name to a very pricey piece of paper, get ready for the big bucks: $599 or $699, depending on the model you choose. It can all be a little confusing, yes -- and if you aren't upgrade eligible or have questions about your individual situation, your best bet is to go into a store; representatives can typically work magic on your account that you can't work yourself through AT&T's website. There are probably two very large groups of people thinking about buying an iPhone right now. One set is current users, either those with the 3G, or those still using the original model. The other set is a group of new users -- people who've never owned an iPhone and are now faced with not one, but two different options when it comes to getting in the door. For both groups, there are huge questions to answer about whether or not getting the 3GS makes sense, and very few of them have to do with the quality of the phone. For current users, we have this to say: the iPhone 3GS is a solid spec bump to a phone you already own... but it is, at its core, a phone you already own. Your real deciding factors will be two-fold, first, are you able to purchase the 3GS at a price which is reasonable or sensible to you? For a lot of current users -- particularly more recent customers -- the pricing will be exorbitant, and it's hard to think of dropping $399 or $499 when you've just shelled out for a very, very similar phone (remember, you're paying for a speed bump, a compass, and video recording). On the other hand, if you're within contract renewal range and you don't plan on jumping platforms anytime soon, $199 nabs you an unquestionably excellent smartphone. That conclusion speaks to new users who are undecided about the iPhone (or exactly which iPhone to buy). At this stage, we wouldn't recommend anything but the 3GS for newcomers planning on getting into Apple's game. For another $100, you're nabbing a much more robust device with a handful of great additions. It's a small price to pay for something you plan to keep long term -- or until Apple pops the next iteration on us. The other big questions here aren't about the 3G or 3GS -- they're about Apple's platform and AT&T's network. While the smartphone market has cracked wide open lately, the iPhone is arguably the market leader (at least in mindshare), and really does showcase a superb platform -- lack of physical keyboard and multitasking aside. AT&T, on the other hand, isn't exactly acting like the top-tier carrier it's supposed to be, and its service can sometimes be maddeningly poor. So while it's tough to argue with the package Apple has put together (a stellar device with just enough new to make it nearly perfect), we couldn't help feeling a bit let down by the 3GS. Maybe we've been spoiled by devices like the Pre and Ion (and it's possible we're a little numb to OS 3.0 since we've played with the beta for a while now), but the additions of video recording, a compass, and a speed bump just don't seem that compelling to us. The mix of new features and a ever-growing App Store will still be potent to new buyers -- but pricing schemes which amount to hundreds more for current owners might give previous early adopters and eager upgraders reason for pause. Ultimately we're not saying it's time to jump ship, but we've come to expect a bit more pedal to the floor from Apple -- you've raised the bar guys, now it's time to jump over it.